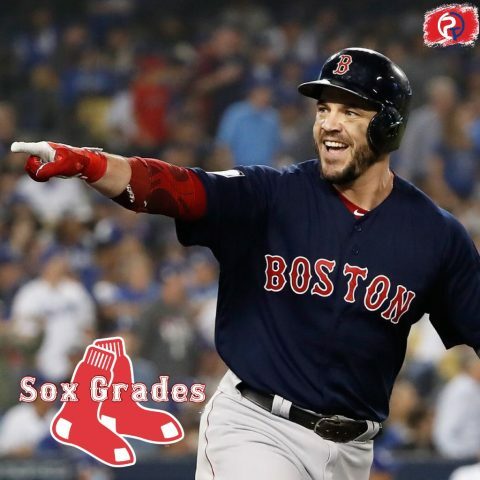 In this installment of Sox Grades, our panelists took a look at three corner infielders who were instrumental in the Red Sox run to a title. From Eduardo Nuñez’s antics in the field to Mitch Moreland’s tale of two halves, these Red Sox all contributed at some point down the stretch and through the postseason. Without further ado, let’s get into it. Jeremy: It was a tale of two halves for Moreland in 2018. After signing a two-year deal to return to the Red Sox, Moreland found himself benched to start the year in favor of a scorching Hanley Ramirez. After Ramirez cooled off, Moreland’s production really started to show. He was selected as an All-Star and was cruising along until August. He suffered a knee injury, and never looked the same, a shell of himself throughout the rest of the regular campaign. He also suffered a hamstring strain during ALDS Game 2. But he healed up in time to draw big walks against the Astros in the ALCS, and launch a three-run bomb in the World Series. All in all, Moreland did enough to garner a solid grade despite a historically bad last two months. Jordan: Mitch Moreland had a pretty strange 2018 campaign. He didn’t do a ton of things exceptionally well, he was just himself. Aside from home run production, he was basically the same old Moreland that has been in the MLB since 2010. Except for this time, being Mitch Moreland was enough to make the All-Star game. He was certainly better overall than the production Eric Hosmer put up with his salary in San Diego. However, injuries derailed him in the second half. Well, that and the emergence of Steve Pearce. Overall, can’t really complain about what Moreland provided in 2018 –– especially in October. Even in the World Series, the dude only went 1-8, but he had arguably the biggest hit of the whole postseason with that pinch-hit home run off of Ryan Madson in Game 4. Jeremy: Who would’ve thought that an under-the-radar May acquisition would pay the big dividends that Steve Pearce did. After Moreland fell off the table, Pearce got the starting nod even against righties. He produced perhaps the two biggest turning points in the Red Sox season, a three-homer night against the Yankees in a sweep of New York, and a game-tying jack that knotted the score in Game 4 against the Dodgers, a tie he broke the next inning. He deserved the World Series MVP he got, as he was a tremendous source of offense in a lineup that saw both Mookie Betts and JD Martinez falter in the Fall Classic. Also, so much for his terrible defense right? Jordan: Those words have stuck with me since the World Series. So to steal from the lips of Joe Buck, I’ll just say “How about Steve Pearce?” I mean, he’s now played for every team in the AL East, but only been a crucial part of two. But surely when the Red Sox plucked him from the Jays prior to the deadline for table scraps, nobody expected him to be one of the reasons this team won the World Series. The scouting reports on Pearce and the reason he’d fit well in Boston was “kills lefties, owns the Yankees.” So after the ALDS, I didn’t expect much from Pearce. Well, he hit a big homer off of Joe Smith in Game 3 of the ALCS, then went nuts in Games 4 and 5 of the World Series en route to winning World Series MVP. Given the fact he was traded to Boston for nothing, and the level of production he put out leads him to a very high, yet questionable grade from me. Jeremy: I watched these playoffs with Jordan. And the only thing I could think of to describe Eduardo Nuñez was a circus. He was rumbling, bumbling, stumbling, and tumbling all over the field throughout 2018. Resigning him seemed like a smart move coming into the season, but his knee never really seemed right all year. He was constantly in the dirt like a six-year-old, and his performance in Game 3 of the World Series should’ve earned him an Oscar. That being said, he stepped up admirably throughout the year. He couldn’t field a lick, but he was a serviceable infielder in the place of both Rafael Devers and Dustin Pedroia hitting-wise. Defensively was a different story. He cost them time and time again in the playoffs by making stupid errors at critical times. That being said… the only image I will be able to remember of Nuñez is his legs flailing in the air while tripping over the mound in that marathon of a Game 3. Jordan: So, yeah. Remember that time Eduardo Nuñez was the best player on the Red Sox? The year was 2017, and the Red Sox made a move that many questioned since the guy was known for not playing defense and being an average at best hitter. I didn’t believe it in 2017… now I do. Nunez hit that big homer in Game 1 against the Dodgers and had the funniest at-bat in the history of baseball in Game 3… but that was basically the microcosm of his 2018 season. Random clutch moments, and the occurrence in which he would wind up falling down and staying on the ground for a month of Sundays. All in all, the TV series that was Nuñez was worth it, in my opinion. I had a lot of fun watching him fall over, even if it came with an 0-4 and three strikeout performance.